Disconnect power to the washer (or unplug it). Turn off both hot and cold water lines at the wall shut off valve. The purpose of the basket is to hold the water and clothes while they are being washed and spun dry. To purchase a replacement drive block for your washer, click here. 2. Use the Removing washer cabinet article to help you get to the drive block. 3. Move the vacuum break out of the way. 4. Remove the tub ring and gasket. 5. Remove the agitator and parts. 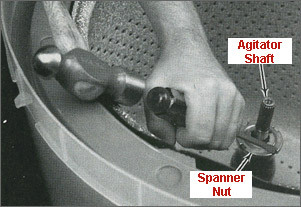 Note: Wearing safety glasses and gloves is recommended when hitting the spanner nut or drive block. This metal is very soft. Note: Be very careful not to hit the basket, as it has a porcelain finish and chips very easily. 6. Insert a screwdriver into one of the slots on the spanner nut. 7. Using a hammer, tap the end of the screwdriver, turning the spanner nut to the left to loosen. 8. Remove the spanner nut. 9. Carefully remove the basket by lifting straight up. 10. Remove the ring filter from the bottom of the basket, if used. 11. Using a hammer, carefully tap up from the bottom of the drive block to remove. 1. 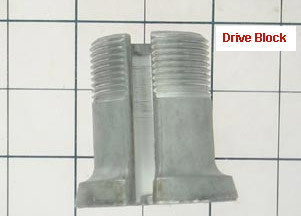 Place the new drive block on the spin tube. 2. 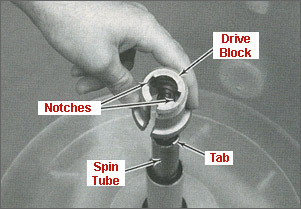 Line up the notches in the drive block with the tabs on the spin tube and push down by hand or tap lightly with a hammer. 3. 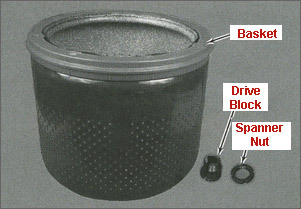 Replace the ring filter on the bottom of the new basket, if used. 4. Place the new basket on top of the drive block. 5. 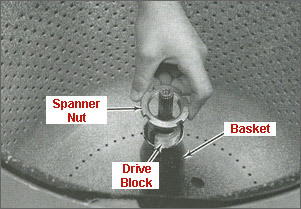 Place the spanner nut on the drive block, turning to the right. 7. Using a hammer, tap the end of the screwdriver, turning the spanner nut to the right to tighten. 8. 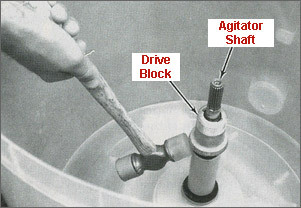 Replace the agitator and parts. 9. Replace the tub ring and gasket. 10. Replace the vacuum break. 11. Use the Re-installing the cabinet article to help you put the washer back together. 12. Plug in washer or reconnect power. If your problem is not listed, try this site.